AUTHOR INFORMATION: Award-winning writer Charles de Lint is considered one of the pioneers and masters of contemporary urban fantasy and has authored over sixty-five books of fiction for both adults and children, short story collections, and non-fiction. Notable releases include his groundbreaking debut “Moonheart”, “Jack the Giant-Killer”, “Moonlight and Vines”, “Seven Wild Sisters”, and “Widdershins”. De Lint has also taught creative writing workshops in Canada and the U.S., served as writer‑in‑residence for two public libraries in Ottawa, and has been a professional musician for over 25 years. “The Mystery of Grace” is his first adult novel in three years. PLOT SUMMARY: On the Day of the Dead at the Solona Music Hall, hot rod mechanic Grace Quintero meets artist John Burns. Grace and John immediately fall for one another, and that would be wonderful, except that they meet two weeks too late. CLASSIFICATION: Living up to the author’s reputation, “The Mystery of Grace” is a magical contemporary fantasy that revolves around life after death, a long-distance love story, and the power of faith. There are some adult themes in the novel, but with its lack of violence and only a few cuss words, I think “The Mystery of Grace” is suitable for younger readers. FORMAT/INFO: “The Mystery of Grace” is 272 pages long. Instead of chapters, the book is broken up into lengthy parts that alternate between Grace’s first-person narratives and John’s third-person POVs. “The Mystery of Grace” is completely self-contained and not part of the author’s Newford series. March 17, 2009 marks the North American Hardcover publication of “The Mystery of Grace” via Tor Books. Cover art is provided by John Jude Palencar. The first thing that really jumped out at me was the accomplished writing. 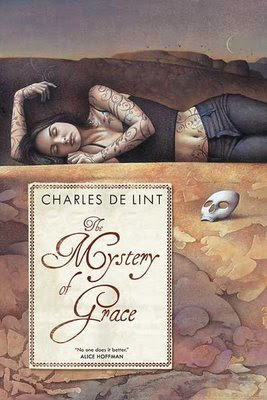 Whether it was his characters, the believable dialogue, his ability to tell a story, or the prose, Charles de Lint’s writing was just excellent and a large part of the reason why “The Mystery of Grace” was such a delight to read. Of the writing, I was most impressed with Charles’ characters and the seemingly effortless manner in which all of the people that show up in the book, both major players and secondary ones, are brought to life with such personality and depth. The second thing that really jumped out at me was the intriguing story. Without giving away too many specifics, Grace one day finds herself trapped in a strange alternate ‘pocketworld’ full of mysterious rules, like being able to travel back to ‘our’ world two times a year—on Halloween and Walpurgis Night (May 1st). It is during one of these return visits that Grace meets, and immediately falls in love with, John Burns. From here “The Mystery of Grace” alternates between a sweet love story about two people whose feelings for one another cannot be denied despite time and distance, and the overarching mystery of how and why this ‘pocketworld’ came to exist. One thing I really enjoyed about the story was how it kept you on your toes, taking pathways that you wouldn’t expect. On the flipside, I had a few issues with “The Mystery of Grace”. One, for all of Grace’s charm and sincerity, I thought her character was a bit clichéd. After all, can’t a person be a ‘gearhead’ without having tattoos all over their body or listening to rockabilly? Speaking of which, how many times can rockabilly be mentioned in a book? Seriously, I think I saw the word rockabilly in the book more times than I’ve ever heard it spoken in my life. Another thing that bothered me were all of the little coincidences like Grace’s friend who just happens to be able to see and speak with ghosts, or John’s friend who just happens to be dating a Wiccan who knows someone that “specialized in books on folktales, mysteries, and the paranormal.” Finally, the story itself falters at the end when it introduces an ‘evil bruja’ and starts delving into issues about faith and moving on that took longer than necessary to get its point across. Can't wait to read this! Thank you for the forthright review.